McElroy: 1.5 y.o. intact boar. Thinks his poo don't stink, and is heir apparent to the cage throne. Can't beat on Oliver, so beats on everyone else instead. Adopted 04.2017 (Texel/Abby cross. Talk about bad hair day.) Also our resident chirper. 1. All was well until the smallest of the kiddos turned 1. As Oliver ages, McElroy challenges, and makes sure that everyone knows who is #2. No blood-drawing fights ever. One hair pulling fight, a month ago. 2. Everyone eats, maintains weight, is generally happy. 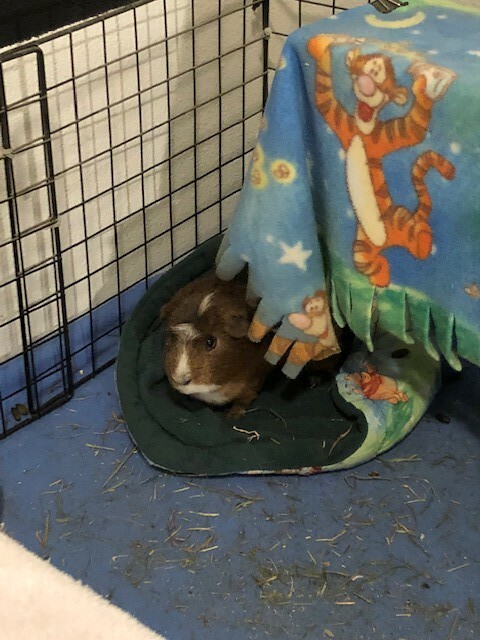 Cage is quiet 3/4 of the time. Everyone is happy when veggies are present. 3. I'm sure that Rocky is tired of his head being humped. 4. 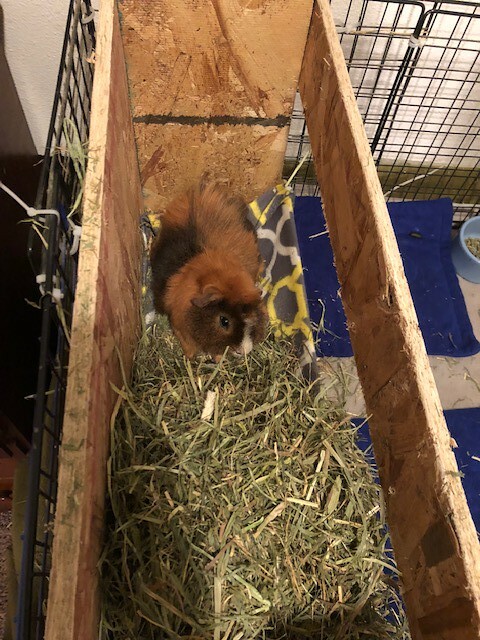 Cage has abundent beds, and a VERY large hay box, with room for all. 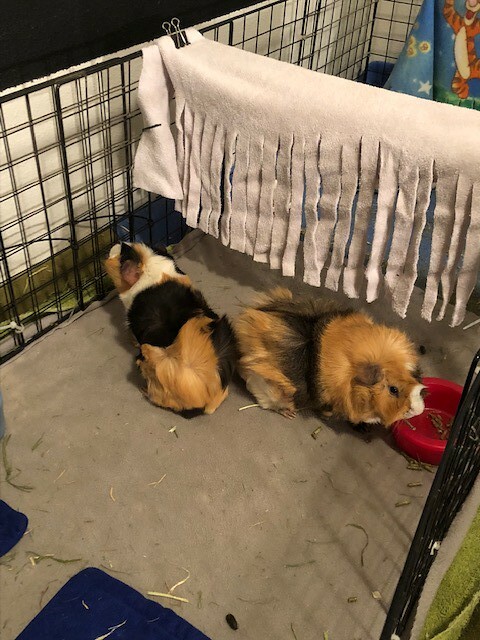 Fights are never over food, or when veggies are present. This is mostly a whiny post - I'm ready for them to stop irritating their mom, and be friends again! NOT looking to separate - they can work through their jazz on their own, with monitoring. 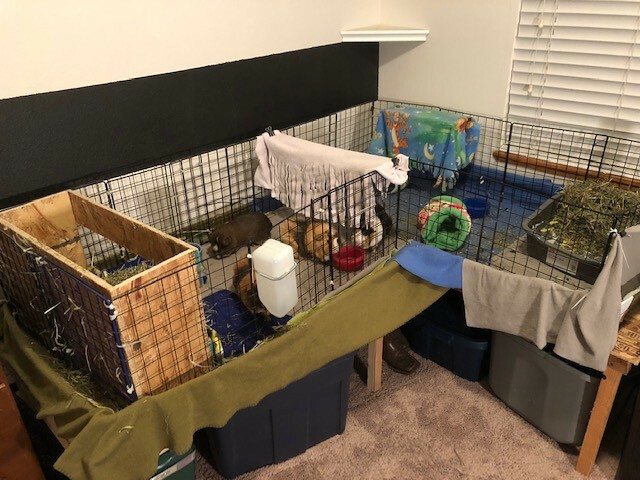 I have ordered some environment enrichment things for them, in hopes to distract them from each other, and hope the cage expansion will help. Other ideas/commiserations? I know that cage size is key - I'm pushing this as big as I possibly can. Thinking I may add a fleece "curtain" in the middle to add some sectioning. Breaking up the sight lines really helps, I think. Strategically placed fleece strips or curtains contribute to "out of sight, out of mind" philosophies, I think. How about a corner cage bumper (plush animal attached to cage) to give Rocky's head a break? Cage revamp last night went well. 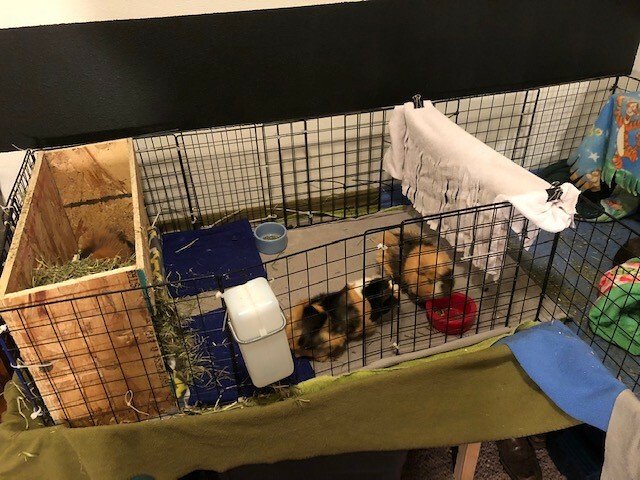 They love the divider fringe, and all was peaceful last night and this morning. Lynx, I love your stuffed animal idea, I will be trying that for sure! 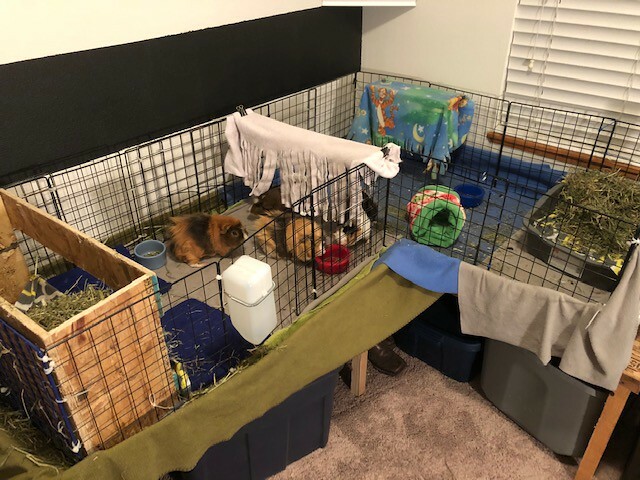 Their extra cage things should be here on Thursday! Mine have all sampled a pellet or two, but none has ever actually eaten them.